What are we missing when we look at data to improve instruction? The visual chart address how this process directly relates school administrators, teachers, parents and families, business and philanthropic leaders, state policy makers. Our hearts go out to the victims of the most recent violent attack on the runners and spectators of the Boston Marathon. As the people of Boston and the US recover from this latest act of terrorism, CEC and CCBD wish to convey our deepest heartfelt condolences. We offer the following tips for educators knowing that this week, Boston schoolchildren and their teachers return to school from a spring break that was interrupted by violence. Violence permeates our world. It is a fact. However, when violent acts occur in the midst of normal everyday events they put people on a heightened state of alert and cause justifiable levels of stress and anxiety. Students are likely to feel most vulnerable when these situations occur. It is the responsibility of adults to help them feel safe. Educators can help students understand what is happening factually, how events do or do not impact their lives, and how to cope with their reactions. Educators need to assess what level of support students in their care need. The following suggestions may help them cope. Teachers should assess student needs. Talk to colleagues to help. Share your ideas and concerns. This will help you manage your own anxieties as well as determine the needs of the general student body and individual students. Also take cues from what your students do and say. Know who has family who has experienced trauma or another risk factor. Potential student reactions to trauma. Most students will be able to cope with their concerns over current events with the help of parents and teachers. However, some students may be at risk of more extreme reactions because of personal circumstances. Symptoms may differ depending on age. Adults should contact a professional if children exhibit significant changes in behavior or any of the following symptoms over an extended period of time. •	Preschoolers-thumb sucking, bedwetting, clinging to parents, sleep disturbances, loss of appetite, fear of the dark, regression in behavior, withdrawal from friends and routines. •	Elementary School Children-irritability, aggressiveness, clinginess, nightmares, school avoidance, poor concentration, withdrawal from activities and friends. •	Adolescents-sleeping and eating disturbances, agitation, increase in conflicts, physical complaints, delinquent behavior and poor concentration. Beyond these specific indicators of worried and anxious reactions, some students will simply show differences in their patterns of behavior. The student who is normally talkative may be quiet. The student who is normally friendly may be withdrawn or show atypical angry responses to others. The student who usually turns in assignments may be late or the work may be less than satisfactory. A good rule of thumb is that if you see any differences in behavior, those differences are expressions of concern. What about Post Traumatic Stress Disorder (PTSD)? PTSD is a significant, and often delayed, response to an event that is experienced as traumatic. The individual may show a number of symptoms, including agitation and inappropriate responses to normal events. For example, the individual experiencing PTSD may show startle responses to sudden noises, avoidance of certain places or people, or a high level of defensiveness or aggression, out of character with their normal behaviors. One of the more difficult aspects of PTSD is that the individual may not show symptoms for an extended period past the triggering event(s). So six months later the symptoms may occur, and it may be difficult to connect them to the event(s). •	Live in proximity to past traumatic events or “high” target areas. •	Live in ‘violent’ neighborhoods. •	Have suffered a personal loss from or been exposed to terrorism, violence or military actions. •	Have parents currently in the military or on active duty in the reserve forces. •	Have parents who fought in past or ongoing conflicts like the Iraq War or are currently in Afghanistan. •	Have parents involved in emergency response or public safety. •	Are of non-U.S. origin and may feel threatened by intolerance or racism. •	Experience Posttraumatic Stress Disorder, depression or other mental illness. Create a Positive School Environment and Culture. The best things schools can do to ensure students and others in times of crisis and trauma that they are safe is to have built an environment and culture that is positive and welcoming. Infusing a caring climate and maintaining that through trauma and crisis invites students to share their thoughts, feelings and emotions which helps them to get through it. Remain calm and reassuring. Students will take their cues from you, especially young children. Acknowledge that the threats and uncertainty are unnerving but the likelihood is that you and your students will be okay. There is difference between the possibility of danger and the probability of it affecting them personally. Acknowledge and normalize their feelings. Allow students to discuss their feelings and concerns and encourage any questions they may have regarding this event. Listen and empathize. An empathetic listener is very important. Let them know that others are feeling the same way and that their reactions are normal and expected. Set aside time to discuss the topic and then stick to the normal routine of the school day as best as possible given the circumstances and what seems to be appropriate. Empathic listeners help individuals feel comfortable with their thoughts. One of the most important things to do for an individual is to make it safe to share both simple and complex feelings. Simple questions such as, “That sounds really scary! Were you scared? Do you think about it a lot? If that happened to me, I would be.” The listener isn’t doing “therapy” but is making it safe for the individual to say what they are thinking and feeling. The act of getting thoughts and feelings “out” is healing and preventive. How far do you go in these “normalizing” conversations? Generally you ask basic questions, listen intently, avoid over-interpreting, and go as far as the individual seems comfortable going. And for some students, the “conversations” may take other forms, including art, music, and writing. Courage, compassion, and helpfulness – In the midst of frightening and tragic events, one often sees examples of courage, compassion, and helpfulness. As in the events in Boston over the past week, it is helpful to also discuss how people step in to help others. This aspect of a difficult event adds to the sense of hope, that in the midst of tragedy, there are ways to bring out the best in people. Take care of your own needs. Take time for yourself and try to deal with your own reactions to the situation as fully as possible. You will be better able to help your students if you are coping well. If you are anxious or upset, your students are more likely to be so as well. Talk to other adults such as family, friends, faith leaders, or a counselor. It is important not to dwell on your fears by yourself. Sharing feelings with others often makes us feel more connected and secure. Take care of your physical health. Make time, however small, to do things you enjoy. Avoid using drugs or alcohol to feel better. Maintain a normal routine. Keeping to a regular schedule can be reassuring and promote physical health. Stick to the school routines as much as possible. Emphasize people's resiliency. Focus on students’ competencies in terms of their daily life and in other difficult times. Help them identify what they have done in the past that helped them cope when they were frightened or upset. Also remind them that the country has weathered many other crises, including terrorism, natural disasters and war, and has emerged stronger and more united each time. Be optimistic. Even if something does happen, most people will be fine physically and will recover from any emotional reactions to the event. Resiliency studies following September 11 indicate that people who coped best were comfortable expressing strong emotions, surrounded by caring family and friends, kept a positive view of the future, and utilized problem solving skills. Be a good listener and observer. Let students guide you as to how concerned they are or how much information they need. If they are not anxious or focused on current events, don't dwell on them. But be available to answer their questions to the best of your ability. Young children may not be able to express themselves verbally. Pay attention to changes in their behavior or social interactions. Most school age children and adolescents can discuss their concerns although they may need you to provide an “opening” to start a conversation. Don't push, but ask what they think about current events. Even if they don't want or need to talk now, they may later and they will know you care what they think and feel. Discuss events in age-appropriate terms. Share information that is appropriate to their age and developmental level. Update them as information changes. Young children may require repeated reassurance during the day. Tell them they are okay and that adults will always take care of them. School age children can understand details and reasons behind specific actions, such as increased security but cannot absorb intense or frightening information. Adolescents may want to discuss issues related to violence, terrorism or war as well as safety issues. Stick to the facts. Answer students’ questions factually and include a positive element to the answer (e.g., “Yes we are on high alert, but we have been here before. It does not mean that something bad will definitely happen.”) Don't speculate about what could happen. Remind students not to ridicule people or ideas just because they are different. The issues of terrorism are complicated. Students, particularly younger ones, will tend to view them in absolute terms, with good guys and bad guys. Reinforce that most people are good and ultimately care about the same things: safety, freedom and opportunity. Remind them that people who support certain ideals also care about protecting innocent lives and that people who oppose ideals care deeply about the United States and the safety of others. Help students explore and express their opinions respectfully. Explain that opinion is not the same as fact. Fact is what actually happens. Opinions are how we feel about what happens. Everyone has a right to their opinion and discussing different views can deepen children's students’ understanding of the world. Addressing the intolerance that leads to conflict and aggression can also help students regain a sense of control. Be willing to discuss the concept of death. Students may be more concerned about dying or their loved one dying, particularly given the intense focus on death in the wake of terrorist attacks. Talking with them is important. Outside resources can be very helpful (e.g., books geared to different ages that explore death and dying, grief and hospice organizations, or faith community, if part of a student’s family life). If a student comes from a home with a resilient belief system or faith, it will likely provide a powerful source of support when it comes to dealing with these issues. Communicate with your students’ families. Communicate to families what the students are learning. Encourage families to share with teachers including if they have a family member on active duty. Let families know that schools are providing extra support to students and that educators may also have loved ones who are called to active duty and/or trying to cope with their own personal reactions to events. Make time for class discussion (or other activities if the children are young). Be sure to have a map or globe. Be prepared to answer questions factually or to guide discussion about difficult issues. Seek the help of your school psychologist or counselor if you are unsure of what to say. Be careful of large group discussion about terrorism if your students have strongly differing opinions. Such discussion can turn adversarial when emotions are running high. If need be, hold discussions in smaller, more homogenous groups or individually. Again, your school psychologist or counselor can help. Stop bullying or harassment immediately. Remind students not to pass judgment on groups of people or other people's ideas just because they seem different. Finding ways to address the intolerance that leads to conflict and aggression can be one way to help students regain a sense of control over this situation. Encourage students to talk to you or another caring adult. Emphasize that you are there to help and that they should let an adult know if they or a friend feels overwhelmed for any reason. Do something positive with students to help others in need. Making a positive contribution to the community or country helps people feel more in control and builds a stronger sense of connection. Finally, after looking and looking for educational websites that support literacy in English and Spanish, I found it! My first review of this website is a good one with many literacy options for teachers,students, parents. I love that it has many books in English and Spanish including many informational texts as well as many other literacy activities.The website doesn't stop there is addresses all the content areas as well as K-12. 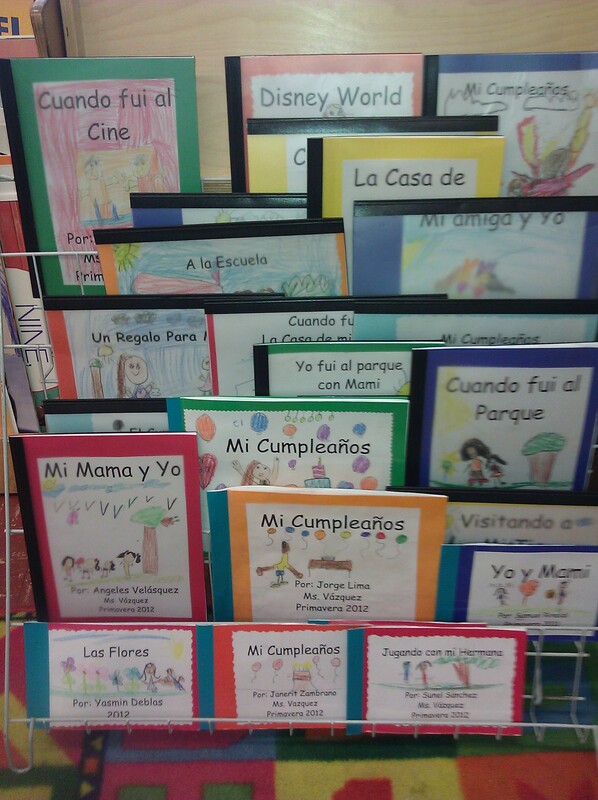 Continued Support for Students to be Bilingual…. How can Response to Intervention (RTI) and Multi-tiered System of Support (MTSS) support English Language Learners with and without Disabilities? How does RTI affect affect English language learner (ELL) students who are already receiving ELL pull out supports? Are we still providing Tier 2 interventions in addition to the ELL class? In her response Dr. Claudia Rinaldi provides recommendations to help teachers working with ELL students within any tier of RTI. One key consideration for serving ELL students is how to leverage RTI teams to increase collaboration and data-driven instructional planning and progress monitoring for all students, including ELL students with and without disabilities.